8. The Push Man, and Other Stories, by Yoshihiro Tatsumi. Published by Drawn and Quarterly, September 2005. Alternative Comics: The purveyors and creators of that material generally don’t prefer the work to be called “Alternative Comics.” It’s a term that necessarily sets the work in a context outside of mainstream acceptance–an alternative to what? Which means that, if you’re it’s an “alternative” comic, you can’t discuss it without discussing what it’s also an alternative to, which at least in the context of North American comics, means “Superheroes”. “Indy” generally doesn’t fly either, except for the very young. “Indy Comics” automatically conjures up notions of, again, working outside mainstream notions of form, or too-often, quality. Not-ready-for-prime-time. It also necessarily excludes “indy” work that comes from major financial backing. Is Dash Shaw or David Heatley “indy” when they’re self-published? When they’re pub’d by Fantagraphics? How about when those self-published comics are the collected by a division of mega-publisher Random House, are they “indy” then? It’s a weird label. Most creators prefer, simply, to say that they make “comics”. No adjective necessary. But when pressed, the phrase that tends to cause the least bristling, to have found the most adherents amongst discerning comics connoisseurs, is “Art Comics.” Comics that are, and/or aspire to be, art, rather than merely existing as illustration, or commercial product. Comics are a mass-produced medium (for the most part), there’s always a tricky and prickly balance between art and commerce in every single book. Few authors have the luxury of their work appearing in print exactly the way they’d intended. Ware, Seth, Clowes, Spiegelman… Probably a dozen others working in the medium, in total. I hadn’t really heard the phrase “Art Comics” before I started working at The Beguiling, much like before I met my husband I hadn’t heard the phrase “Art Music” to refer to music that was not “pop” or, in the common vernacular, popular. Music as art, rather than music for an audience. Sometimes both. But I’ve grown to like the idea of it, all of us as readers forced to consider the intentions of the artist in the creation of work; the mere naming of the type of book a cause for critical examination. Art Comics. Ask for them by name. So then in 2005, after successfully releasing 15 years of art comics, Drawn & Quarterly released their first, and possibly the first, Art-Manga. 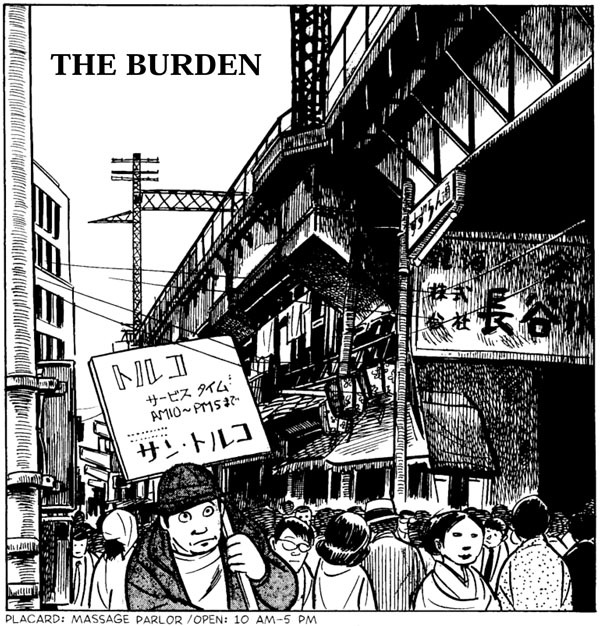 Yoshihiro Tatsumi’s The Push Man and Other Stories is a collection of short works about everyday life in postwar Japan, and the heartbreaking and often horrifying mundaneness of living. It is “Gekiga,” a close-cousin to manga that came from the same place that the phrase Art Comics must: What if there’s a better way to tell better stories with words and pictures? What if instead of ‘irresponsible pictures’, as is one of the translations of the word manga, what if they made dramatic pictures (gekiga)? What if they strove for realism, maturity, experimentation, seriousness, and to touch the human soul? What if all of this ended up in direct contrast to the popular work of the time, but wasn’t a reaction to the work so much as simply being dissatisfied with artificial borders of the medium? What if manga could also be art? Yoshihiro Tatsumi had been beaten to America’s shores twice before the arrival of The Push Man, and both times, by himself. Drawn & Quarterly had published one of Tatsumi’s shorts from The Push Man period, called “Kept” in 2003, in their fifth (and final) Drawn & Quarterly Anthology volume. Going back even further, an unauthorized English-language translation of a Spanish edition of Tatsumi short stories was published in 1988 by Catlan Communications. It was entitled Good-Bye and Other Stories, and until his first visit to North America, Tatsumi himself did not know it had been published. The Push Man came to North America because of Optic Nerve creator Adrian Tomine. He’d owned some of the material, and ‘read’ some of the material, despite his inability to read Japanese. The storytelling in the work is marvelous, with layouts and framing designed to move you effortlessly through the story, except when it’s designed to give you pause. Tomine admitted to learning a lot from the work, declared that the books had reignited his interest in comics when he lost interest in superheroes, and that Tatsumi’s comics informed his own. Tomine pushed for years for material to be translated and brought to a wider English-language audience. That immediately set the context of the work for the readers who were going to encounter it for the first time; one of the most lauded art-comics creators in North America thinks that this guy, and this work, is the best in all of Japan. That’s a hell of a context to have the work released into, not just as a reader, but as a critic, as a bookstore buyer, as a bookseller. As a fan of Adrian’s. Context is important, too. Labels like “Art-Comics” give a context to work, as I mentioned, but format gives a context too. If you’ve read a lot of manga, then you tend to think of manga not just as a collection of storytelling tics, or as work from a country of origin, or big eyes and small mouths, but also as a format. Tokyopop revolutionized format–book size and price point–and made the industry follow along. If you’re manga, then you’re 5.5″ x 7.5″, 200 pages, and $10, give-or-take. The book chains had further solidified that format, where covers needed to feature characters (no more than 2), and the characters needed to be looking right at the reader, and the logos had to be big and bold and easy-to-read from across the store. In 2005, manga was as much a product, a commodity, as it was a medium. But if you’re a Japanese comic and you come out in a 6″ x 9″ Hardcover, with a taped binding, monochrome covers, at $20? What are you then? Are you manga? Or something else? Are you gekiga? Art-manga? Or is just being “other” good enough for a first shot across the bow? It’s important to note that the idea of art-manga had been tried before, and had even found measured success. Fantagraphics had released the excellent and inventive Anywhere But Here by Tori Miki earlier in 2005, and the alt-manga anthology Sake Jock in the 80s. Small publishers like BLAST! books had tried “alternative” manga in their anthologies like Comics Underground Japan. Viz had probably the most sustained success with their Pulp magazine and line of manga in the mid 90s and early 2000s, with a great selection of seinen (men-in-their-late-teens-and-early-20s manga) titles, and the occasional truly “mature” work like the early Jiro Taniguchi noir thriller Benkei in New York, or their groundbreaking release of Tezuka’s late-period masterwork Phoenix. 2005 had already seen Vertical’s Buddha from Tezuka, and the Nouvelle Manga movement that Fanfare was slowly rolling out on our shores, all around the same time, more or less. It should be said that the time was ripe for one big work to come out, to catch really pull the idea of Manga For Adults out of the ether and make it whole. Tomine put his reputation on the line to say that that book would be Tatsumi’s, and convinced D&Q to do the same. I was incredibly excited at the prospect of its release, and in between the announcement of The Push Man and it arriving in stores, I even managed to track down a copy of the illicit Good Bye and other stories from Catlan. Reading those stories, I pretty much knew Push Man would be a hit. Now I’d like to share a photograph with you. I took it while I was at the Osamu Tezuka Museum in the summer of 2009. 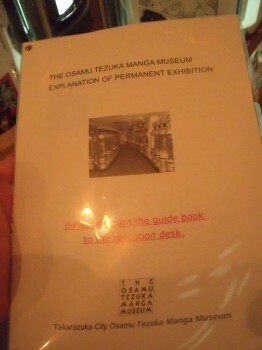 They have a little English-language hand-out guide that explains and translates each of the permanent exhibits. 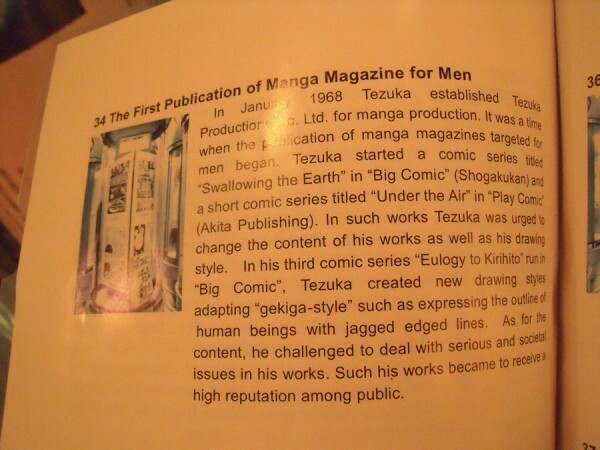 Here’s the section on Tezuka moving to Men’s Manga Magazines. Cover image of the Tezuka Museum Guide I pulled this image from. So let me parse that out for you. Gekiga, or gekiga-style comics, were the mature style of comics that the single-most-popular creator of manga adapted his style to, in order to tell his most mature and important works (including, as mentioned, Ode to Kirihito, which was serialized in Japan from 1970-1971). Tezuka started adapting Gekiga into his work in 1968, more than 10 years after Yoshihiro Tatsumi had worked with a couple of other authors to develop it. While the stories collected in The Push Man are all from 1969, Tatsumi had started telling these short, sharp, pictures of everyday Japanese life years earlier, and their success and innovation caused Tezuka to reinvent himself and create some of his finest works, including Ode to Kirihito, MW, and the later Phoenix stories. Tatsumi really was Capital-I important, with an enormous pedigree. All of this was either intimated or stated outright in the build-up to the release of The Push Man, but if the work hadn’t been any good, it wouldn’t really have mattered. 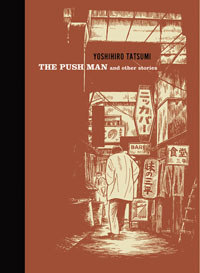 The September 2005 publication of Yoshihiro Tatsumi’s The Push Man and Other Stories was when Art-Manga arrived in North America. It elicited a strong critical reaction, but more importantly a sustained one, with reviews of the work coming all through 2005 and into 2006, when a second volume of Tatsumi shorts was released. The book was a sales success too; it’s currently in its third printing in hardcover. It found an audience. The work was not fantastical in any way, in fact the stories seemed to be entirely without genre trappings or manga shorthand or idioms at all. Tatsumi’s 8-page shorts seemed to consciously reject what we would normally associate with manga in any way it could, Tatsumi telling his stories inspired by police reports or the daily news delivered with a brutal realism, an unflinching eye into the stark realities of urban living. Violent tableaux. But the craft! The craft of these stories is so, so high. They’re not just affecting but effective, with art that’s been developed and then paired down again to the most essential lines, shadows, and ideas. It’s manga that reads like It’s A Good Life If You Don’t Weaken or Louis Riel or Sleepwalking. It’s Drawn & Quarterly manga. It’s Gekiga. It’s Art-Manga. Manga Milestone #5, the release of Tezuka’s Buddha, showed the world that manga could be for Grown-ups, and that it could tackle mature ideas. But it was still, at best, a hybrid book, created not just to engage an adult audience but also to stay friendly to a young one. It didn’t wholly succeed as a work for grown-ups because of its humourous asides and stretch-and-squash cartoon-influenced art. It used a fantastical storytelling style to tell a fantastical, epic story. What was so important about The Push Man is that it showed that manga did tell stories for adults, using realistic art, and straightforward storytelling. It showed that in addition to whatever we thought about manga, it was also about every day life, and it could be bleak and mean and gritty and funny just like life is. It showed that, beyond just being for grown-ups, manga could be literature too. But maybe most importantly, and this was right on the spine, it showed that some artists in Japan were treating comics like a mature, sophisticated venue for telling important stories, in 1969. Context. To date Drawn & Quarterly have released 3 short-story collections by Yoshihiro Tatsumi, including The Push Man and Other Stories, Abandon The Old In Tokyo, and Good-Bye. Their most recent release is Tatsumi’s 845-page autobiography in comics A Drifting Life, which chronicles the birth of the manga industry, the creation of Gekiga, and Tatsumi’s development as a person and creator. Drawn & Quarterly plans to release one of Tatsumi’s earliest genre graphic novels, Black Blizzard, in spring 2010. There have been numerous other wonderful art-manga releases since The Push Man, that I am personally convinced have found a wider and more ready audience because of its release and its success. Previous PostYou Are Listening To The Sound Of My VoiceNext PostYour Daily Dose of FUN: The Latchkey Kids! 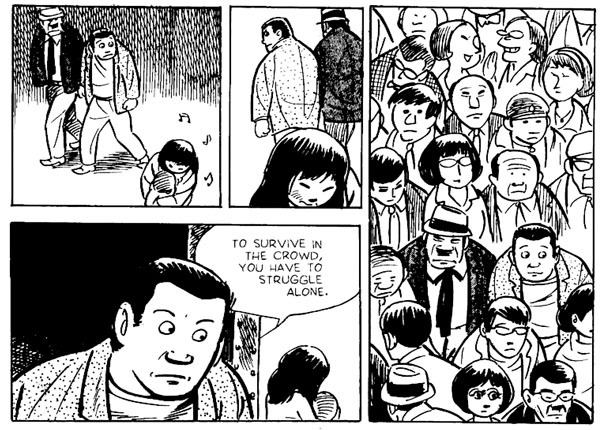 Tatsumi’s style reminds me a lot of Gilbert Hernandez, visually speaking. In fact, I know I read somewhere, I think in one of the TCJ interviews, that Hernandez based the opening chapters of “Poison River” on Tatsumi’s “Goodbye,” which he presumably must have seen in the Catlan version. Out of curiosity, do you know whatever happened with that unlicensed version? Who was responsible, was there ever any legal action, etc.? That’s pretty despicable behavior for a publisher, even if they did have a good eye for talent. if by “the first,” you mena the first in English, I disagree. Catalan actually published a book by Tatsumi called Good-bye and other Stories some 15 year or earlier (if memory serves). It turns out that it was basically bootleg (and translated from Japanese to Spanish to English), but I liked it a lot and really wanted more. In addition, RAW published some alternative manga (including a story by Yoshiharo Tsuge), and Blast Books came out with some, including Comics Underground Japan. There were a few other odds and ends as well, although Drawn & Quarterly’s Tatsumi books have been the handsomest and most sustained effort. Robert, thanks for pointing that out. For us old timers there has always been the suspicion, backed up by a few tantalizing excerpts, that there was more to manga than giant robots. I remember that story by Yoshiharo Tsuge in RAW vividly — it was a revelation. That said, the last decade has opened up a world of manga in English with a scope only imagined by weeaboos and comics fans alike.